Lydia Fenet has always had a certain tenacity. It is that tenacity that led her to call the intern coordinator at Christie’s, one of the world’s leading auction houses, every single day until she agreed to let her into the already full program. Today, she has risen through the ranks to become Christie’s Managing Director and Global Head of Strategic Partnerships—a position for which, as she discusses in her book, she created and negotiated the terms. In The Most Powerful Woman in the Room Is You, Lydia shares not only stories from her own life and rise to the top of the food chain at one of the most esteemed auction houses in the world but also how women in other fields can also harness their own power to get the most out of their careers, create a roadmap for their lives, and even find a bit of work-life balance along the way. Fenet’s debut is part memoir, part practical tips for harnessing the type of confidence that everyone can’t help but notice. She shares stories of her own failures, from childhood right on up, like that of her devastation over not making her high school’s a capella singing group and how she turned that loss into a win. Fenet also details several of her triumphs—and how she achieved them—like the act of earning well over a charitable organization’s fundraising goal with her paddle raise method that keeps the audience entertained and engaged. Fenet also calls on other successful women to share their practical tips. From Chief Client Officer and Head of Advertising at Refinery29 Ashley Miles’s tips on building and working a network to President of Carolina Herrera Emilie Rubinfeld’s story about how her upbringing has impacted her business, readers will walk away with tips and inspiration from some of the most impactful and well-known women in a variety of fields today. Fenet’s “Strike Method,” her way of instantly commanding whatever room she is in, is perhaps one of the most unique takeaways she shares in The Most Powerful Woman in the Room Is You. While not every woman can get away with striking a gavel three times at the beginning of a talk or presentation, Fenet recommends that every woman have her own strike method, her own special ritual for calming her mind, clearing her head and instantly letting everyone else in the room know who’s boss. Fenet calls on her Southern upbringing and the women who shaped her life, notably her grandmother, and takeaways from them. She also shares her favorite tips for using failures to create growth, harnessing the power of community, evolving and innovating, and even inspiring others and leading by example. She discusses the power breakfasts that she and a friend began to create community and share ideas with other powerful women in her area—and urges readers to do the same. It is that harnessing of connection and community that Fenet believes is ultimately the key to many women’s success. 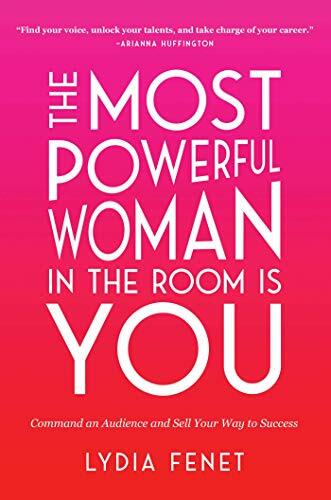 Overall, The Most Powerful Woman in the Room Is You, is an insightful, inspiring guide for women who are trying to claim their own seat at the table. Fenet’s frank, no-nonsense writing style and approachable tactics can’t help but inspire readers to reach for their own goals in new, bigger ways. Kristy Woodson Harvey is a staff reviewer at New York Journal of Books.